The garden is having to take care of itself. This means vines are scrambling all over the place, fruit is swelling, the animals are growing and one of the new guinea pigs is due to deliver in around a fortnight I have calculated. The grapes have done incredibly well this season and have really established themselves. Many with small bunches of fruit which we have tried before the mildew set in quite bad. Still, the growth has been there to really train them and get them set for future years of production. The choko is having a hard time of it with the dry winds and now some rain to confuse things. I still have faith that it will produce like it did last year, once the winds drop over the next few weeks. I am thinking of moving the vines root if I can to the other side of the garden for next year. Failing that I will just start again with a new plant. The grapes are doing well in that area so rather than go through the drama of easterlies whipping the life out of the choko I will encourage the grapes and move the choko to a better spot. While I am at it I will work out the best way to keep a slow stream of water feeding it so that it is well situated for the winds next year. I have big plans for the new back garden bed. I am waiting on pumpkins to ripen and seeds to form in some herbs then the whole garden will be filled with everything I can possibly muster to throw into it and really build up the soil. I plan to let it sit for a few weeks and possibly then only plant a green manure or a good crop of broad beans. The salad plants that have been planted in containers are doing really well and have survived through the hottest days with not real problem. Even snails and slugs have been kept at bay though I expect that to change with wetter weather. Nonetheless they are easy to manage and are a lot simpler to plan out successive crops quantities for the kitchen. 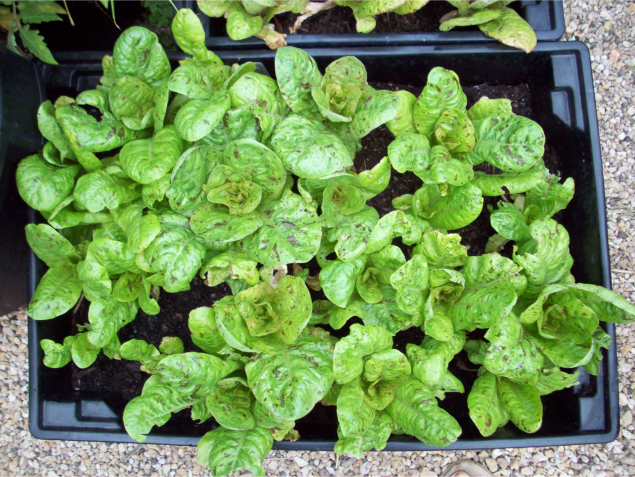 My favourite lettuce for the time is the Freckles lettuce ( a type of Romaine lettuce). It has really provided well after just a few weeks, giving us a couple of leaves a day until it just grew too fast and I am now thinning out those that look like going to seed for the kitchen to save some of the last for hopefully (slow to bolt) seed. Despite a fairly steady stream of visitors coming to check out the garden it is somewhat of an embarrassment at the moment for several reasons. With the winds this time of the year and being in the depths of summer the garden is really dry and in some areas I encourage this so that seeds dry out for saving. This year I am also changing my game plan a little and so once I have harvested from some beds I have not replanted and am letting the soil rest while I plan out the final play. Some areas of the garden will be relinquished to permanent beds of drought tolerant herbs and plants. Vertical areas such as the fences and any supports added will be relied upon heavily for their ability to support a crop of something edible out of the way of the rest of the garden area. I am also planning to construct some further structures to allow for the grape vines to spread out in areas. For this I have already starting encouraging growth out along fishing line which is another reason the garden kind of looks a bit haphazard at the moment. A friend did tell me though that you just have to give in to feeling awkward about your garden at this time of the year. Those folks that don’t garden are usually thrilled to see someone else doing it – and those folks that do garden are just as thrilled to see how someone else is doing it. So I haven’t felt too bad about it this year despite the collective chaos. There is still a lot of interesting things to see and for anyone local it is also about what works in this kind of weather – and what doesn’t. Its all learning. Under the house still looks like a major crime scene with stuff strewn everywhere. It has gradually got better but I need a good few hours to just tidy the lot up. It is much better after putting the paving in and some shelving and digging out a bit more dirt. I think the majority of our chicks are roosters. This could be a bad thing. I think that the freezer will be full. We shall have to see. They are doing fine though and most of our original chooks – Penny, Stella, Jennifer and Clarice – are all back on the lay. Well, mostly.. I investigated my oca pots yesterday. Very disappointing. Not a tuber anywhere. With the new back garden I am anticipating focusing on growing sweet potatoes and root vegetables. Oca will have to wait for now. 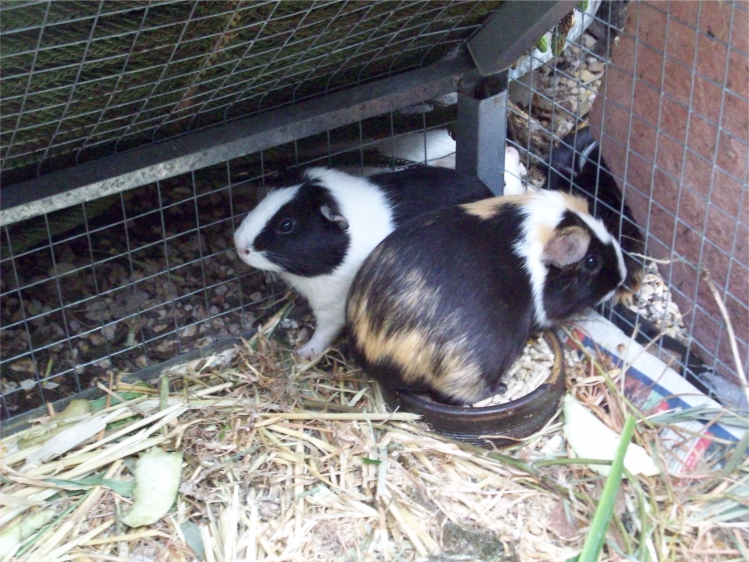 Maiki and Jazz are enjoying the back garden much more than I thought they would. It has also allowed me to slacken my vigilance on the rest of the garden and just allow tomatoes to hang a little lower and ripen at will. Most of the beans I planted this year have set some seed and this will be kept for planting out this year for building stocks. The aquaponics is doing fine but still not rocketing along as I really haven’t been feeding into it that much. I am however researching some information that I will start to experiment with over time and will post my results. Over the summer I have come across some interesting info that I really am keen to try – just need to make the time to get it going. One of these is bokashi. Most people have heard about it by now and I have not given it a go due to the fact that I only saw it in shops and didn’t want to fall into the trap of having to frequently purchase products on a regular basis. I am going to give making my own a try as I already have the micro-organisms happening on a regular basis with my kefir making. Plus I can make it in bulk and will be able to also direct sow some of it into the garden at times. Yesterday my first delivery of water kefir arrived. I will probably post separately on this. I have wanted to give it a go for some time. Another NEW pet! So all this is going on but I haven’t really been out there all that much. We are getting a reasonable harvest of tomatoes and most of my seed saving has been done, or is nearly complete – unless I come across a real stunner of a specimen. With my wife not eating as much tomatoes this summer due to breastfeeding, I have taken to freezing chopped up tomatoes in packs for use later, rather than bottling them which I did last year. In this way I have made the most of the tomatoes I took seeds from. I’ve had success with freezing cape gooseberries and strawberries and bananas for smoothies so why not tomatoes! Plus we already get our blueberries frozen – though I do have plants waiting to go into the garden! 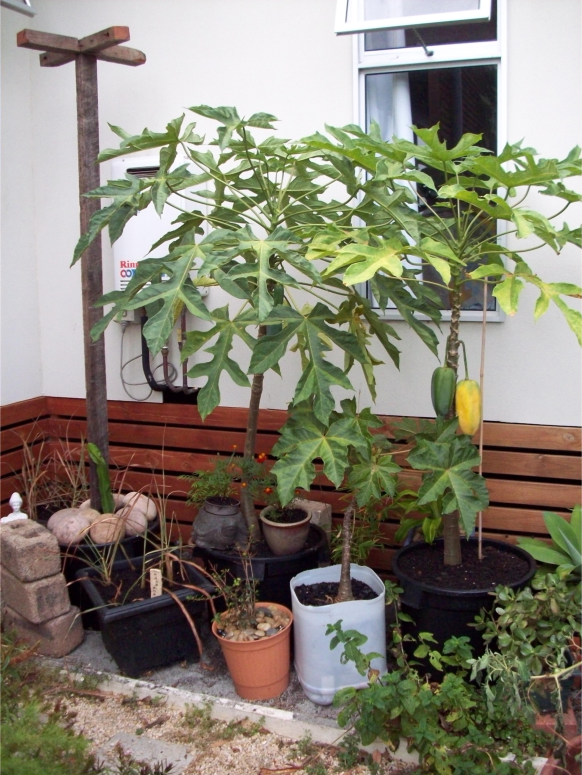 On the whole though it is a point of rest for the garden and a time to re-pot plants (as in the tropicals in the sun-trap in this photo) and to clear the mind to begin to formulate a plan for the next garden design. One that I hope will carry the garden a little more majestically through many more hot summers to come. Time will only tell.